Each of these principles contributes to the overall success of your space. Today we will be focusing on Balance, which refers to achieving visual equilibrium through ordered distribution of elements of equal visual weight around a central axis. The balance of a space can be symmetrical, asymmetrical, or radial. Color is a quick and simple tool for achieving balance in a space. 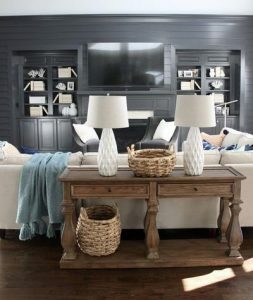 The dark accent wall in the photo below balances the deep colors in the desktop and fireplace surround. The elements in the room are asymmetrical, yet still feel balanced. Symmetry is a surefire way to bring a sense of peace and balance to a space. In the photo below, the designer capitalized on the symmetrical built-ins and styled them accordingly. The identical chairs and pair of lamps also contribute to the cohesiveness and balance of the room. The central axis of the room below radiates from the light fixture. The symmetry of the chairs on either side of the French doors, as well as both sides of the table add a sense of balance to the room. The candelabras on both ends of the table keep the room grounded despite the angled ceiling in the room. Are you looking to add some balance to your home décor? Our designers and color consultants are here to help you achieve your design dreams! Come see us at Columbia Paint or Clarksville Paint and Decorating Design Centers for one on one assistance. We have over 250 wallcovering books and nearly as many fabric books. We also carry rugs, window coverings, and everything you need to paint your space. Stay tuned for next week’s design principle feature; We will be providing more tips and tricks to DIY your interior design. We are proud to announce our second location, Clarksville Paint & Decorating! Carrying the same products and providing the same quality customer service as the Columbia location, we look forward to serving Clarksville and the surrounding communities of Dayton, Highland, Glenelg, Glenwood, Cooksville, West Friendship and more!